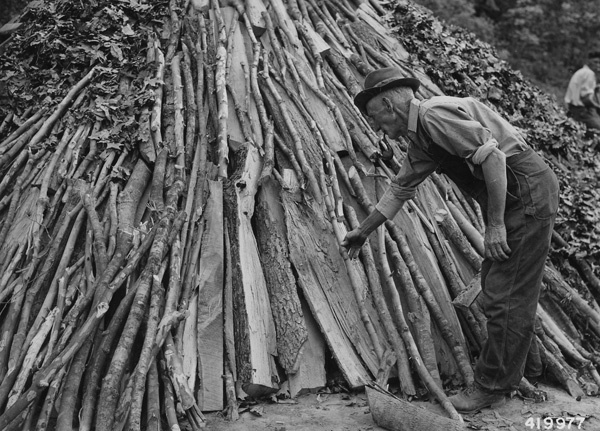 In-forest charcoal making was part of the colonial landscape and extended into the 20th century. Charcoal making is an ancient art, and colonists no doubt brought European techniques with them. Livingston’s Ancram iron furnace, founded ca. 1749, burned charcoal; and smaller scale operations likely existed before that. 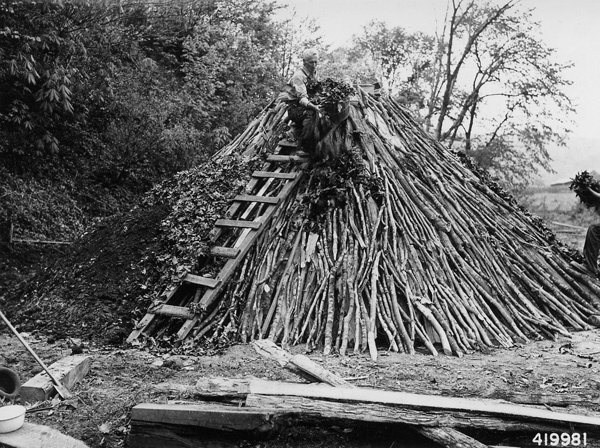 The traditional round charcoal mound was in use in England (where it was called a “clamp”) at least as early as the Middle Ages. 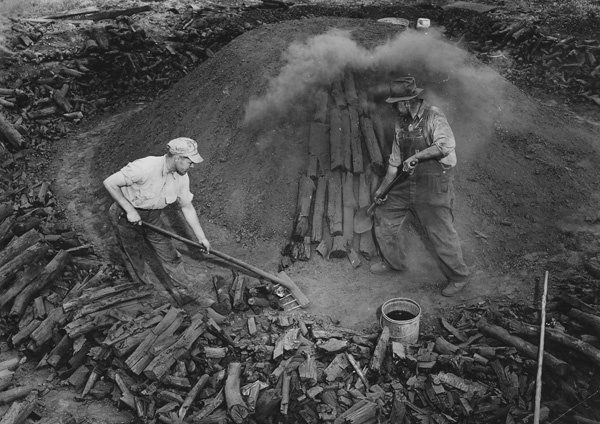 In Columbia County, charcoaling has primarily been associated with the charcoal-iron industries, first at Ancram, then at Copake and Chatham during the 19th century. 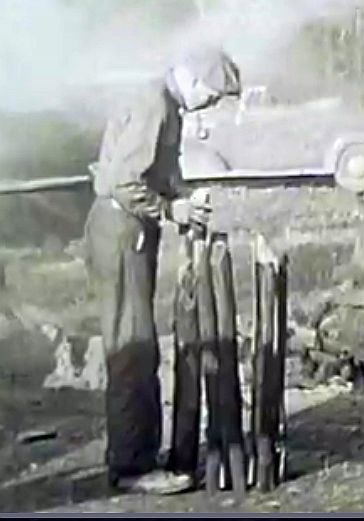 However, charcoal was also in demand by blacksmiths, tin smiths, glass blowers and others needing a hot, clean fire. In addition, it was used by locomotives entering cities because its burning produced relatively little smoke. Would you like to contribute information to our 'Footprints of the Colliers' project? You can use this web app to find mapped pits in the field and comment on their validity. You can help by using the app (or any other version of our map of Columbia County pits), and then ground truthing pits in your area. Simply find an apparent pit in the forest and then scrape away the surface debris to see if you encounter black soil studded with charcoal bits. Our points are not completely precise, but navigating to the mapped location of a pit should get you within sight of the actual pit if there is one. Remember not to look for an actual pit or hole in the ground but rather for a raised, circular area about 35' across - think putting green, but without the lawn. If you confirm a pit or find that we mapped something that wasn't a true charcoal pit, please indicate your finding in the app or email us with a georeferenced snapshot or a copy of a map indicating your location. If you would like to make your own maps, but don't yet have mapping (aka GIS) software, we recommend QGIS, which is open-source and free. Have questions, would like a map, or simply want to talk pits? Drop us an email. As will be explained below, 'pits' weren't true pit, but rather were cordwood mounds. 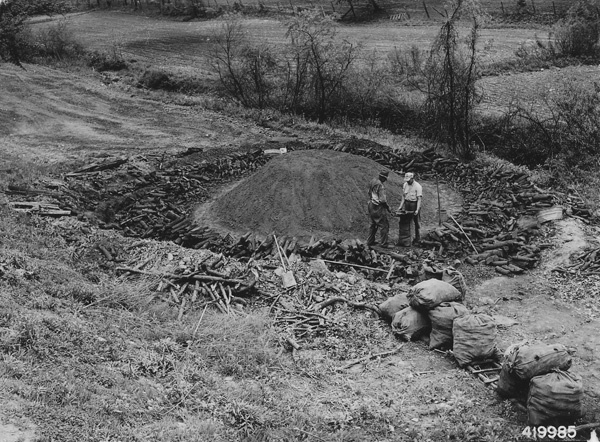 As a base for their mounds, colliers created flat, circular areas roughly 35' across, and, although the mounds themselves were burnt long ago and the resulting charcoal carried off, the circular flats remain. These are not always conspicuous as you walk through a forest, but luckily, a newly available form of topographic aerial mapping called LiDAR (“Light Detection And Ranging”) provides us with a crucial overview of the landscape’s microtopography and allows us to remotely map the location of pits across the County. Hours spent inspecting a county-wide LiDAR map (mostly the work of our son, Otter) produced a detailed map of Columbia County pits. 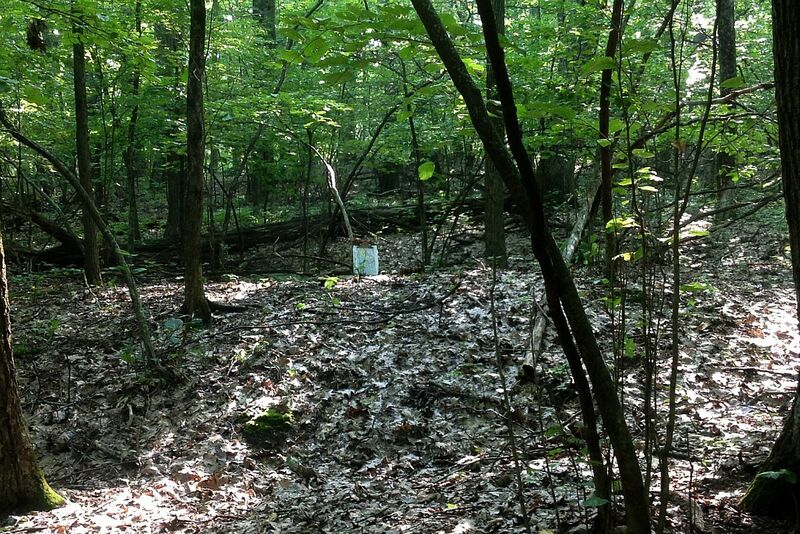 Ground-truthing at a couple of sites suggests that 90-95% of these pits truly are former charcoal mounds (the remainder may be small circular wetlands, natural mounds and other structures). As the map at the top of the page shows, our charcoal pits are found primarily on the hilly eastern frontier. Many of these pits probably helped supply the Copake Iron Works, although Mt. Washington in MA and lands in Vermont are referenced as the main sources of that iron works’ charcoal. Furnaces in Chatham and Millerton NY and Richmond MA may have also received some of the local charcoal. The goal of the burn itself was to manage a wood fire so that water and impurities were burnt off, but the carbon fuel itself remained. The resulting charcoal was more porous than wood (and hence allowed greater oxygen permeation and a hotter burn), and it burned relatively clean, an important characteristic when one wanted to produce a high-quality iron. The basic logic of charcoal making involves heating wood to a temperature at which a slow, non-oxygen-demanding burn (called pyrolysis) begins. Once begun, that burn is self-sustaining so long as its fuels remain, a quicker oxygenated burn does not start, and temperature is maintained. Under these conditions, a nearly pure carbon fuel is formed which burns readily in the presence of oxygen. The collier’s art was thus to initiate the pyrolysis through a conventional wood fire, but then to encourage that pyrolysis while squelching the oxygen-fed burn. This fine tuning was accomplished through the construction of the mound or clamp. Various on-line resources detail a mound’s construction; this video, which we had no hand in producing, seems particularly informative. The historical images below, all from the National Archives or the Library of Congress, also illustrate the process. In brief, a cleared, flat area was first created in the forest. 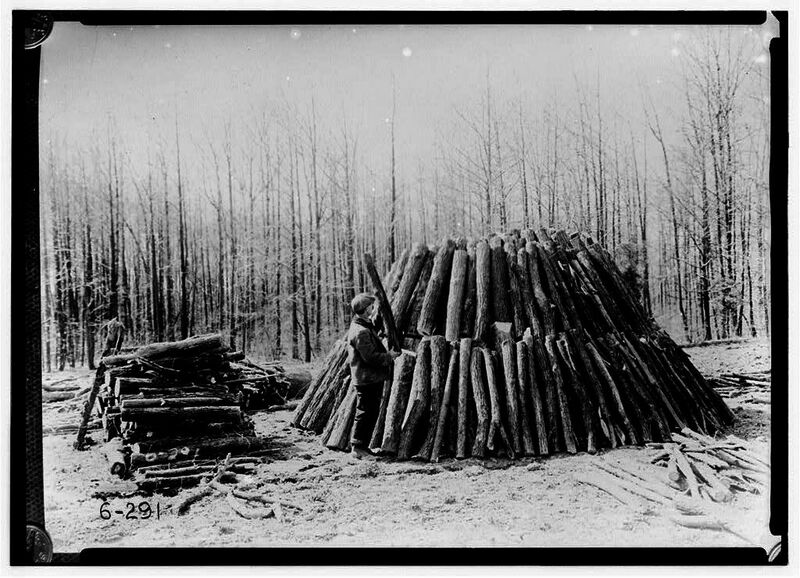 A central chimney was built of split wood and the 4’ logs were carefully laid around that in two or more layers to form a solid wooden mound 30-40’ in diameter. This was covered with leaves and other organic debris and sealed with dirt. A fire was started in the chimney, and once it spread, the chimney was sealed and the mound carefully tended to insure that oxygen did not enter. After about two weeks, pyrolysis had more or less burnt itself out, and the mound was allowed to cool. Finally, it was raked open or "drawn", and the charcoal gathered for shipment. At any stage in the process (including the transportation! ), an uncontrolled, open-air fire could destroy the fuel, if not also cause property damage and/or injury. A recent view of a charcoal 'pit' - these appear as small terraces in the forest and can sometimes be inconspicuous. In this shot, a clipboard is propped upright in the center of the 'pit'. 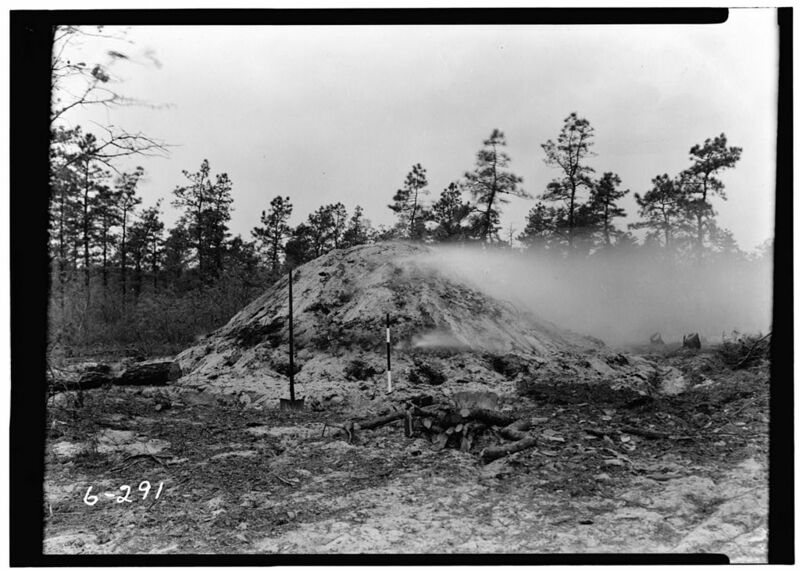 Charcoaling with mounds faded from our landscape around the turn of the 19th century. To some degree, it was replaced by the use of permanent kilns to which cut wood was hauled for use. These permitted more efficient, controlled burns. As transportation expanded and coal became widely accessible, it replaced charcoal at some furnaces - although charcoal iron and coal iron existed side-by-side for a while, because charcoal's greater purity produced superior pig iron. Gradually, the area lost not only charcoaling, but the entire iron industry as it shifted west to where much larger iron ore deposits exist. Today, coke is apparently used to fuel most blast furnaces. One can think of coke as 'charcoaled' coal, i.e., the coal is heated in the absence of oxygen resulting in a purfied coal product. 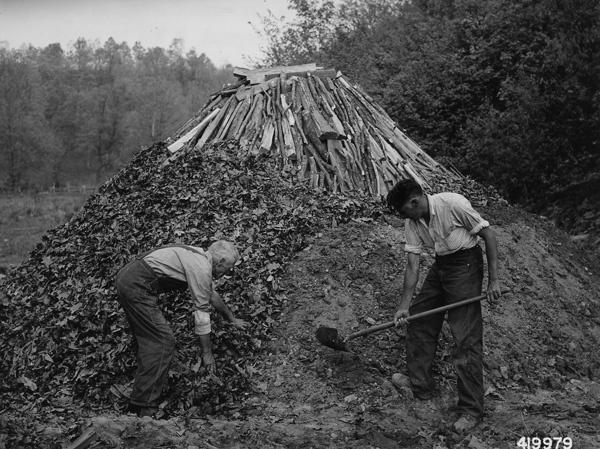 Iron ore mining, smelting, charcoaling, iron casting, and blacksmithing are long gone arts in our county, but charcoal pits are one of that era's most enduring legacies. 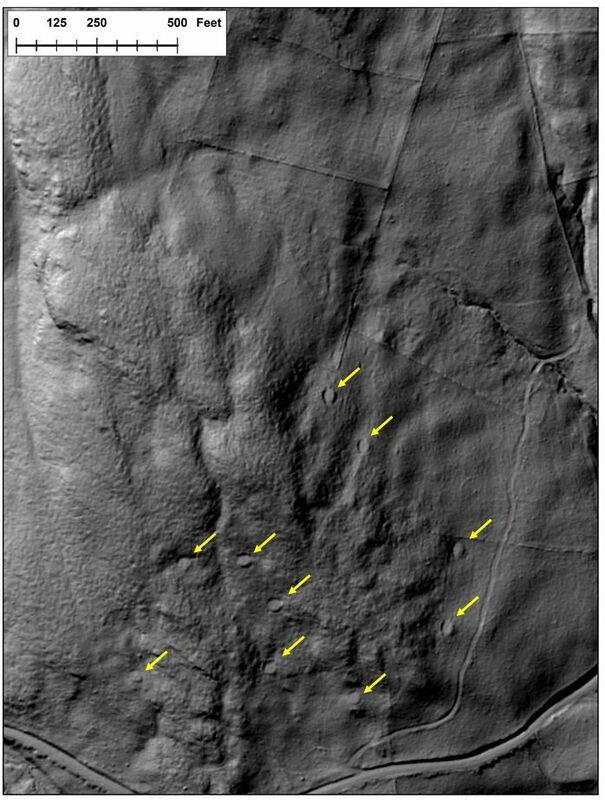 Will Ouimet of UConn, together with colleagues and students, has been using LiDAR to study the charcoal pits and stone walls of Litchfield and Berkshire Counties. For more on their work, see this web page. We've shared our pit maps with them and, at some, point charcoal pit aficionados will have a regional map to admire. 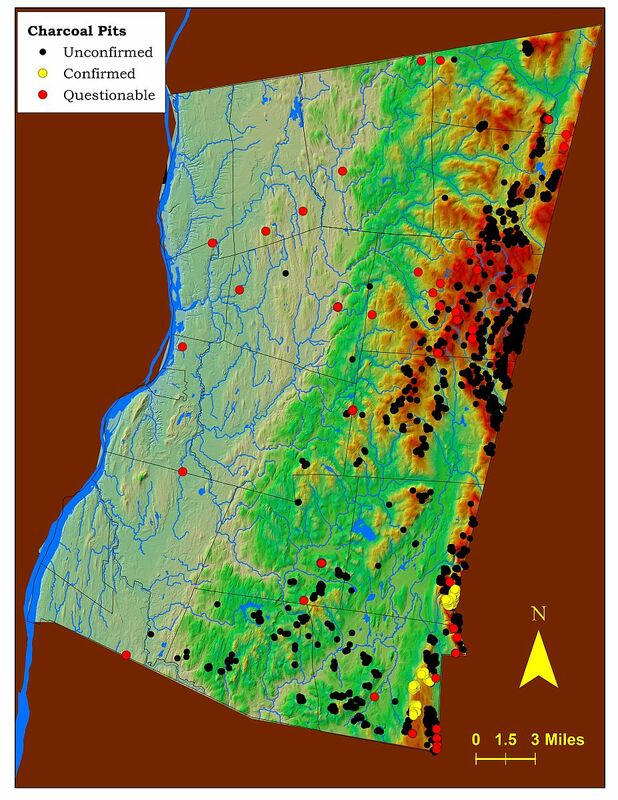 In addition, 200 Years of Soot and Sweat: The History and Archeology of Vermont's Iron, Charcoal, and Lime Industries, Victor R. Rolando's excellent study of those industries, is now available free on-line thanks to the Vermont Archeological Society. This publication from Hopewell Furnace also looks interesting. And don't forget to check out the Copake Iron Works!